OP 41 - OPERATION "BALLINGCLAY"
Operation "Ballingclay" was a supply dropping mission to the Yugoslavian Partisans flown on the night of November 24, 1944. The drop point was to be marked by the Partisans with a "V" in fires, and this point was to be further marked by the pathfinder force using red sky markers (flares with parachutes). MacIsaac led the flight for 37 Squadron in Wellington MF473 "A". He and his crew took off from Tortorella at 1610 hours carrying six "E" type containers and fourteen packets of nickels. The weather was initially cloudy, with four to five-tenths cloud ranging from 5000 to 10,000 feet, later clearing as the Squadron approached the target area. At the target area both the "V" and red sky markers were identified by all crews. Thirty "E" and twenty four "D" type containers were dropped with good concentration on the target point. Wellington "W" had its containers hang up on the bomb rack and these were returned to base. One parachute was known to have failed to open, but there was some doubt about several others opening successfully as well. 128 packets of leaflets were dropped between the Yugoslav coast and 10 miles from the drop point. The starboard wing of Wellington "F’, captained by F/O Cave, was "holed’ by several containers falling from another aircraft but managed to return safely to base. MacIsaac landed at Tortorella at 1897 hours. They had made it - this landing marked the completion of their "tour of ops" with No. 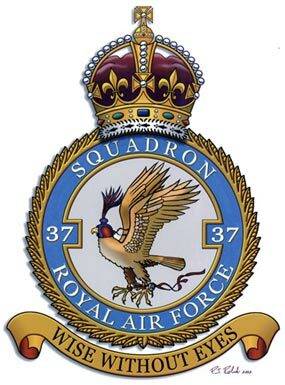 37 Squadron. Sport - The Squadron lst Xl football team drew 0 - 0 with No. 240 Wing in the 205 Group Football League. Accident - A M.T. accident occurred on the main road leading from the camp site at Foggia, near the camp, in which LAC. WORGAN the driver of one of the lorries in the collision, was injured. The lorry was slightly damaged. Visit - Air Chief Marshall Sir Arthur TEDDER, G.O.B. and Lady Tedder visited the Squadron and inspected the Camp site - later they took off from Tortorella. 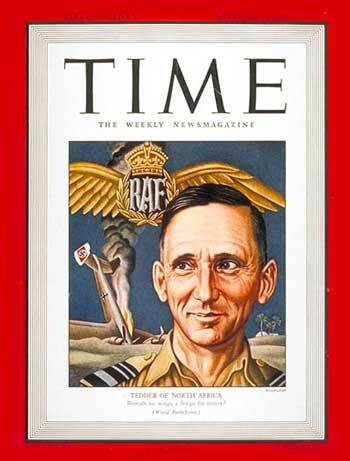 Air Chief Marshall Sir Arthur Tedder, RAF, "Tedder of North Africa", on the cover of the November 9, 1942 issue of Time Magazine. Investigation - F/O Hussey was detailed to carry out an investigation into the accident to RAF Vehicle 308109 resulting in damage to the vehicle and injuries to LAC WORGAN. Sport - A General Sports Meeting was held in the airmens mess at 1830 hours, when various points came under discussion, particularly the problem of boot shortage which is acute. Administration - P/O Slorack was appointed Officer i/c Sergeants Mess - vice F/O Brooke. The operational activities of the Squadron during the first part of the month were confined almost entirely to the dropping of supplies to Partisans in Yugo-Slavia and Northern Italy. The squadron suffered a severe loss when W/O. PIKE and his crew were found dead in the wreckage of their aircraft, which had crashed into the Gargans in exceptionally bad weather. In addition to being an outstanding pilot this W/O as C.N.C. of the Sergeants Mess had done much towards its improvement. During the second phase, daylight bombing attacks were concentrated against German Forces in Yugo-Slavia who were attempting to escape North from Albania and Greece. The purpose of the attacks being to destroy M.T. and crater roads. The 4000lb aircraft made several attacks on SARAJEVO WEST MARSHALLING YARDS in daylight and good results were achieved. Two of the Squadrons aircraft were missing after an abortive attack on Szombathely. The latter part of the month brought bad weather and the Squadron did not operate after November 25th. The Squadron was visited during the month by Air Chief Marshall Sir Arthur and Lady TEDDER and also Air Chief Marshall Sir Edgar Ludlow McWITT, Inspector General of the R.A.F. All showed interest in the newly built showers which continue to work satisfactorily. No. 37 Squadron, R. A. F.
Discipline - Stray dogs have become rather numerous on the Domestic Camp Site although quite a number have already been destroyed in accordance with notices published in D.R.O’s to this effect. Sport - The Squadron lst Xl football team were defeated by 3 goals to 1 in the 205 Group Footballl League. Discipline - A Field General Court Martial held at Headquarters, No. 205 Group found Sgt. WEBB guilty of W.O.A.S. Shamefully failing to do his utmost to carry out a warlike operation in the face of the enemy. The maximum penalty was not imposed. Promulgation of sentence is awaited. The Defending Officer has petitioned against this finding. Security - In order to combat the numerous thefts which have occurred recently, Police Dogs and Handlers are now operating in the Camp precincts. Warnings have been given that challenges must be answered quickly, failure to reply will result in the release of the Dogs. On December 6, 1944, W/O James MacIsaac and his crew were officially declared O.T.E. - Operational Tour Expired. They left No. 37 Squadron and the airfield at Tortorella for the Headquarters of the MAAF, there to await transport to new postings. On December 13, 1944 the crew went their separate ways. MacIsaac departed from Italy bound for RAF HQME (Headquarters, Middle East Theater of Operations) where he would eventually become a test pilot and volunteer for an operational tour of duty in the Pacific Theater. In the fifteen months (February 1944 to May 1945) that 205 Group conducted operations from Foggia, there were 431 possible days/nights for operations. 205 Group flew on 332 of them. 416 operations were carried out for the loss of 240 aircraft. Nearly 1500 airmen lost their lives.